Do you want to see my tattoo? No, I’m crabbing with my son! Today, me, the munchkins and Grandma P went to Scarborough for the day. In the past, every planned or impromptu trip to the glorious East Yorkshire coast usually ends up with us being soaked to the skin or being so blown away by the wind that my hair starts to resemble that of a 1989 Pat Sharpe. However, today it was glorious and because it wasn’t the weekend or the summer holidays, it was quiet. Yay for maternity leave. I return to work in a few weeks and need to get a few family days out in now that the sun is finally starting to shine. We arrived just after 11 and no sooner did we step out of the car and the girl had a meltdown. What caused this meltdown you ask? 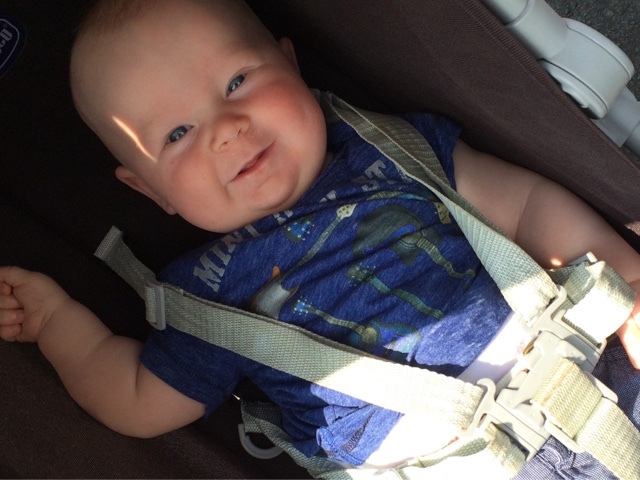 Her five month old defenceless little brother had dared to use her pushchair – the pushchair that she hadn’t used in over a year. Loving the fact that he has peed off his sister. This resulted in me using my ‘right, I am taking you back home’ tactic and started to open up the car. Always one to throw a curve ball into the mix, she agreed because she was tired and didn’t want to walk. Damn it. I had to quickly back peddle. This worked. Although, not quite the way I wanted as the strop turned into tears of despair. Grandma intervened. ‘Do you want to go on the little choo choo train and then we will come back and get the other pushchair out too?’ (We didn’t think we would get two on the miniture train). This worked better. (Note to self: be nice and don’t use threats – especially ones you have no intention of following through.) 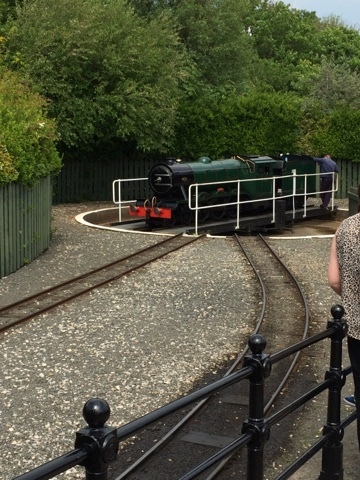 So off we went to experience the mini train. I had to carry the girl up to the ticket shop. Even though the strop had ended, she was still too exhausted to walk the two hundred yards to the ticket office. Once we were all board the train all was well with the world again and we ‘oohed’ and ‘ahhhed’ at the beach, the castle and the fact that is was so hot. We decided to have little wonder for half an hour and by that point the boy had decided to make his presence known. 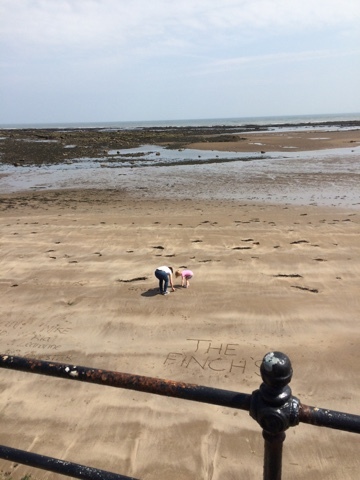 The girl and Gran went to go and write their names in the sand. Me? What did I do? You know the answer to this already: I fed the boy. Today’s unusual feeding place was standing up, (I have now mastered just about every position), rocking and turning away from every person who decided to walk past. Thankfully, it wasn’t busy, but I was still doing a slow rotating circle along the beach front. Then the girl looked up and noticed an opportunity. She was no longer writing her name in the sand. She was bounding towards me; her eyes fixated on something. She stopped abruptly in front of me and suddenly ‘remembered that she was tired’, bent down to ‘catch her breath’ and then threw herself into the pushchair. God, she’s good. 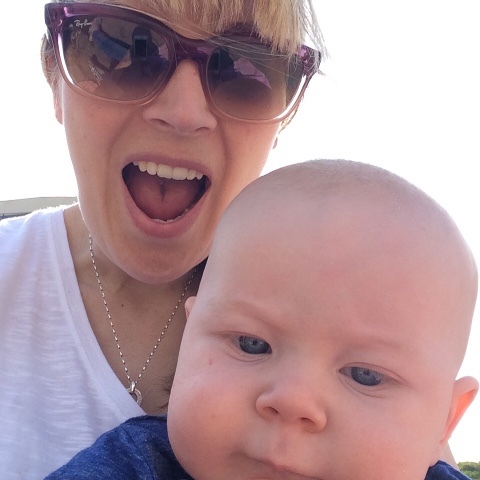 I had to carry the boy back up to the train, (with Grandma pushing a heavy three year old) where I quickly changed his nappy on a train seat whilst shouting ‘second child’, shaking my head and rolling my eyes to anyone who glanced my way. Poor kid; I change him anywhere. We are not ‘The Finch’s’, not with that apostrophe error! Next stop was fish and chips as you can’t go to the seaside without having fish and chips. We chose an ‘award winning’ one that also had a five out of five rating from Trip Advisor so we were pretty confident that they would taste delicious. We made it just in time though as it shut at 1.30pm. If we ever needed further confirmation that the fish and chips were worth every penny, it came from the quite elderly woman who arrived at her favourite fish bar at 1.35pm, found the doors firmly shut and proceeded to turn the sea air blue with her profanities. 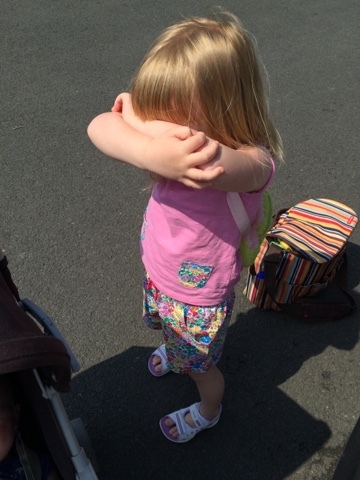 Covering my daughter’s ears, we ate up and I resisted the urge to lick my lips and rub my stomach in front of the still annoyed (and yet, still lingering) woman and off we went to buy a bucket and spade for the beach. 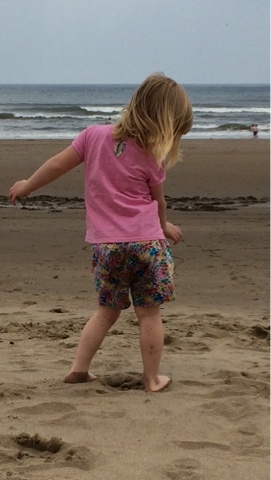 In another life – a life where I am still in my twenties without children – I could have fallen asleep on that beach, something didn’t think I would ever be able to say about Scarborough. Anyway, as it happens, I am well into my thirties and blessed with two munchkins so I had to make do with laying on a Peppa Pig blanket spluttering out pieces of flying sand that were being shaven away from the girl’s sandcastles. Grandma and my girl then went to go and paddle in the sea and I laid back down. You know how this bit pans out. The boy woke and I fed him on the beach. I have to give myself the tiniest pat on that back at this point as I really struggled at feeding in public the first time round and would get very stressed at the thought of it. However, thanks to a lot of reading of articles on the internet this time around, I have learnt to put the needs of my child over what others think. Also, at the end of the day, does anyone care? I think it was all in my head. Serious bit over. Grandma and my girl returned and it was my turn to take her to the sea. The girl has, until recently, being a bit wussy around the water and I guess it’s partly my fault as I don’t really get the time to take her swimming. I was very impressed that she was paddling happily in the sea and running onto the sand when the tide washed up. What the girl didn’t notice though (neither did I at first) was that scattered along the beach were a few washed up dead crabs. When I did finally notice one I internally freaked out and then praised the Lord that I had kept my shoes on. I chose not to alert the girl until she chose to run in from the sea and step on one. She didn’t realise, but I couldn’t hold it in. ‘Argh! You’ve stepped on a crab!’ I yelled. There had to be a meltdown brewing; I had made a terrible terrible mistake. However, much to my complete and total surprise, she just bent down and asked if it was asleep. I nodded and took her to show another and another and another. Poor ‘sleeping’ crabs. As I was doing this, I noticed a Dad was doing something similar with his son. I haven’t yet discussed with you my teenage (and adult) obsession with the greatest band on Earth: Green Day. Don’t worry, I won’t bore you with all the pointless knowledge embedded into my brain about this awesome band. (I’ll just bore you with this blog post instead.) But, I noticed something familiar on the dad’s arm. It was a tattoo of the Kerplunk Flower. 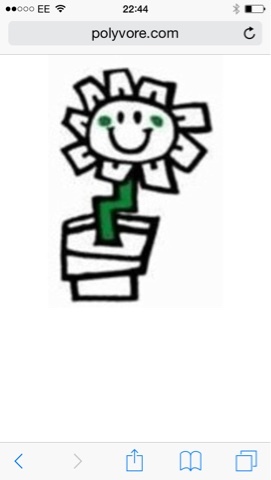 I too am the (not so proud) owner of a tattoo of the Kerplunk Flower but mine is on my stomach. A stomach which has now twice been stretched to its full capacity leaving the poor little flower a bit worse for wear. Note to my seventeen year old self, who asked her mum to go with her to get a Green Day tattoo: (Could I be more of a geek?) Your stomach will not always look like it does at seventeen. Despite all this though, this Dad had to know that he had a kindred Kerplunk spirit standing right next to him. ‘You have the Kerplunk flower,’ I said. I lifted my t-shirt slightly and showed him my smaller, older and blurrier Kerplunk Flower on my postpartum stomach. ‘Oh yeah,’ was his reply. Oh yeah? Oh yeah? Was that it? Were we not going to have some heated discussion as to whether ‘Kerplunk’ was better than ‘Dookie’ and have Green Day, with their last three releases, lost their greatness? No, of course we weren’t because he was crabbing with his son, he was holidaying with his wife (who I hope to God didn’t think I was flirting), we were complete strangers and it would just be weird. Proper weird. I went back to running in and out of the sea with my daughter. I was secretly smiling inside though as it’s always nice to find a fellow Kerplunk fan even if he thinks you are strange woman who should be putting more attention into playing with her daughter. More feeding on the beach followed and I think a pre-teen boy noticed what I was doing because when I looked up I noticed him staring and he didn’t do the polite thing and look away. He just continued to stare until he was hurried along by his mother. I hope I haven’t scarred him for life. I probably have. After a good hour on the beach, we went to find a coffee shop, had some cake and decided to make our way home. We packed the car up and within minutes of driving, the two munchkins were fast asleep. The moment I posted a ‘pretty perfect day out’ post on my Facebook status, we got caught up in a huge traffic jam. There had been an accident, but rather than complain, we were thankful that it wasn’t us in the accident and hoped that all involved were okay. Then the boy woke up. This then made me glance into the back and I realised I hadn’t fastened the seatbelt around his chair properly. I clambered into the back, lifted him out of his chair, (the traffic was at a stand still and I obviously wasn’t the driver) stripped him to cool him down, fed him, calmed him and placed him back in his seat securely and safely. It’s a bloody good job he did wake up and alert me to my total and utter slackness. We ended up being stuck in traffic for about an hour, but despite this, when I think about it, it was a pretty perfect day by the sea with sun, sand, sea, a miniature train, fish and chips, an elderly profanity spewing woman, lattes, cakes, my favourite people in the world, my mum paying for everything and a dad with a Green Day tattoo. Well, my strange definition of ‘perfect’ anyway. And beach fun. Look how excited he is! Categories: by the sea, fish and chips, Green Day, Scarborough, Trip Advisor | Permalink.